Grant McCann has urged his Doncaster Rovers team to dust themselves down from back-to-back defeats and attack the next 12 league games like they did the first. Rovers crashed to their heaviest home defeat for seven years as they went down 4-0 to Fleetwood Town on Saturday. But they can still reflect positively on the opening quarter of the campaign which sees them lie sixth in the League One table with 21 points from a possible 36. 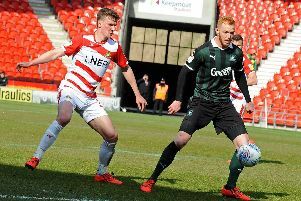 And despite defeats to Accrington and Fleetwood in the space of a week, McCann is confident Rovers can replicate, if not better, that form over the next 12 games. “We’re into the next 12 games now and this is when it matters,” said McCann. “The top six can start pulling away from the six teams below and we’ve got to make sure we're one of them. “I’ve said to the group we will be. One hundred per cent we will be. “We’ll treat these next 12 games like we did the first 12. “The league starts to take shape over the next 12. McCann was keen to draw a line under a self-inflicted heavy defeat to the Cod Army. “As a staff and and as a team we made four mistakes which cost us the game,” he said. “I know this sounds strange but I thought we played well in the first half in terms of the chances we created. “But it was a tale of both boxes. “We conceded off two set plays and there were a couple of other mistakes, and at the other end we didn’t take our chances. “We got what we deserved in the end. Andy Butler is unlikely to be risked against Grimsby Town in the Checkatrade Trophy tomorrow night after he went off during the closing stages of Saturday’s defeat holding his collar bone.